The iphone/IPAD product can only use the airplay function, and the Apple Store does not support Google's HOME APP. Android phones need to download Google Home APP to support the chromcast function and make related settings. Specific can see our instructions. You can also contact the seller to request a video. 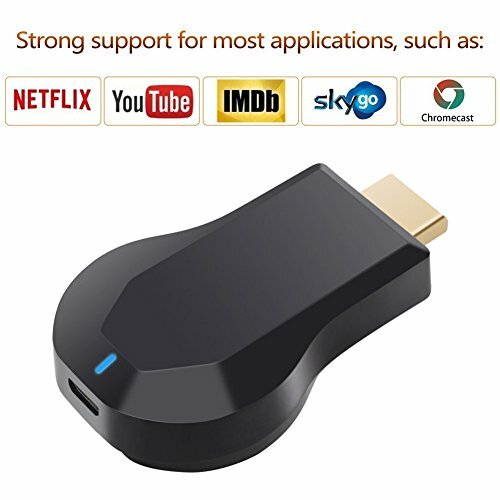 【Support online movies / videos, online TV channels, online webcast/web browsing.】 Support most video websites(app or online)- YouTube, Facebook, Twitter...【In addition it's powerful features: 】compatible with the app that requires copyright, like Netflix/ iTunes/ Amazon Video/ HBO go/ Hulu Plus/ Honda Motor/ ESPN/Google Pixel. 【Note】: Using NETFLIX/iTunes/Amazon Video/ HBO go/ Hulu Plus/ Honda Motor/ ESPN/Google Pixel, you need to open Goog le app:home. Set up your Chromecast. The setting method can ask the seller for a video operation or instructions. Since the Apple Store does not support Google's HOME APP, iphone/IPAD products can only use the airplay feature. 【Operation instructions: 】If you have any problems with the use, you can contact the seller to answer, or request the latest version of the manual documentation and video instructions.